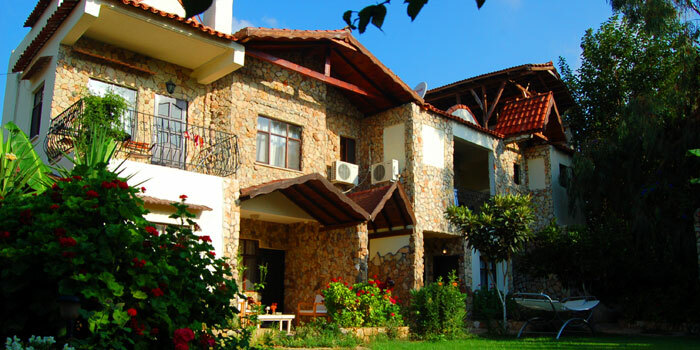 Hotel Villa Monte is considered one of the best small hotels in Cirali (Ã‡Ä±ralÄ±) with its nice location, special and warm architecture, picturesque garden, comfortable rooms, delicious Mediterranean cuisine and its hospitality. Our rooms which offer a variety for single to family accommodation are all equipped with air-conditioning system, minibar, kettle and a tea corner along with a complimentary set of black/ green/ herbal teas. The standard and family rooms have been designed to meet our guestsâ€™ expectations for a nice holiday. Our family rooms which have two rooms inside each other are comfortable for 3 to 5 member families. Our hotel offers delicious and light Mediterranean cuisine. The chef specializes in seasonal dishes with a touch of Turkish heritage cooking. Our guests may decide to stay for dinner or not on a daily basis. We prepare separate set menus for adults and kids with fresh ingredients. The light but tasty dishes prepared by our chef are sure to leave you wanting more. Our hotel is just 200 meters away from the Cirali beach. Our guests will be using the small path through the family pensions and lemon gardens to reach the beach. There are deck chairs and umbrellas at the beach for a relaxing and comfortable beach holiday. Cirali is an ideal holiday paradise for families and for romantic getaways with its wide range of activities in the heart of nature. Although generally mentioned as Cirali Village, it is not a village itself but a part of UlupÄ±nar KÃ¶yÃ¼ (Ulupinar Village) which is famous for its rivers going through the forest and the restaurants set on those rivers. The area is a part of Olimpos BeydaÄŸlarÄ± National Park. 90 kilometers to Antalya and 35 kilometers to Kemer, Cirali is a governmentally protected area because of its ecological importance. It is a nestling place for Caretta Caretta's (Loggerhead Sea Turtles). It is a great experience to see them nesting or volunteering to help baby Caretta Carettaâ€™s to reach to sea. By the efforts of WWF, the blue flagged sea with its crystal-clear water and 3 km-long beach keeps its untouched form marvelous. Cool water of two different rivers reaches the sea makes the area unique. There are lots of activities for the travelers who are looking for something more than a beach holiday. One of them is trekking. Cirali is the eastern end of the famous Lycian Way. Lycian Way is one of the best long distance trekking routes in the World. 500 kilometer route starts from Fethiye, ends at Antalya. The popular trekking routes passing through Cirali are Cirali â€“ Ulupinar â€“ Chimaera (YanartaÅŸ), Cirali â€“ Maden Koyu â€“ Phaselis â€“ Tekirova, Cirali â€“ Olympos â€“ Musa DaÄŸÄ± â€“ Adrasan, Cirali â€“ Beycik â€“ TahtalÄ± DaÄŸÄ±. Most of the routes are marked with red and white signs. One of the easy level trekking routes at our village is Cirali â€“ Chimaera (YanartaÅŸ) route. It is 4 kilometers from our hotel and is famous for the flames on the hill getting out of the rocks creating a magnificent view. There may be seen archaeological ruins also. It is better to visit the place especially in the evening time. Some other archeological ruins travelers may visit are at Olympos Archeological City. Cirali is just 10-minute away by walk from the Olympos ruins aging 2000 years. Although it may seem like a small city, if travelers get deeper in the forest, they will have a chance to find more and more remains under the shady huge trees which makes the city unique and gives a mystical sense.